Our Cordant Values unite us and establish the behaviours which are critical to achieving our mission. Collaboration, candor, opportunity, relentlessness and disruptive innovation are at the heart of everything we do - shaping the way we deliver our services and conduct our operations. As a brand we want to grow and develop and we recognise the importance of adapting to the fast paced and ever changing nature of our industry. We want to be thought leaders and changemakers - inspiring colleagues, clients and candidates. 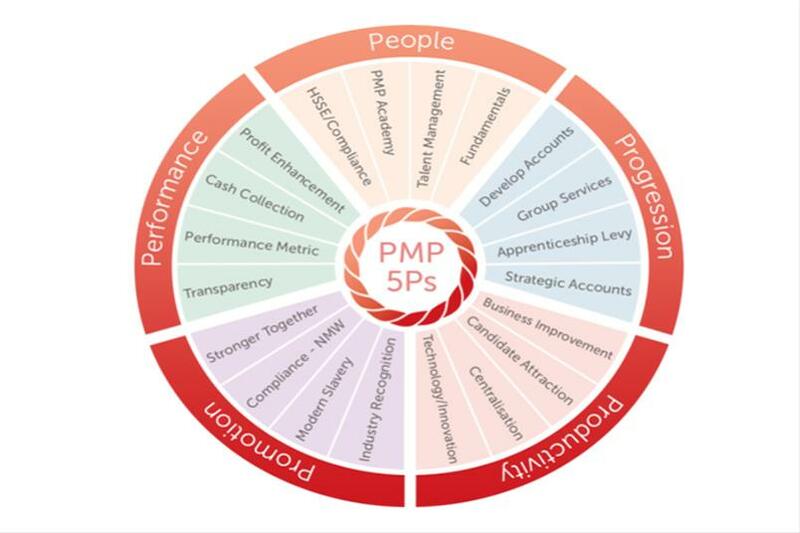 In line with the Group values we have formed the ‘5Ps’ which represent how PMP want to be positioned in the marketplace. The 5Ps define us as being; People focused - Progressive - Productive - Principled promoters - Performance driven. Creating programmes for colleagues that encourages an opportunity for them to grow and development their career, skills, potential and future. Implementation of an all new personal development review process. Promote apprenticeships, and developed fast track programmes for colleagues recognised as business leaders of tomorrow. The acquisition and development of new business, and the nurturing of current client contracts. The implementation of innovative solutions across our existing client portfolio. Introduction of a sales lead scheme. Campaign to brief colleagues on other services from across the Group. Focus on technology, innovation, candidate attraction and stakeholder experience to transform PMP. Launch a onboarding app allowing candidates to register for jobs anytime, anywhere. Enhance and report on our profitability and how that will be reinvested. Introduce slicker processes and more transparency for clients and colleagues. Reduced second tier usage by bringing ad-hoc business in house and utilising the capabilities of our Group brands. Supported the abolishment of modern slavery throughout our supply chains. Build a relationship with influencers dedicated to abolishing modern slavery. Embrace Stronger Together, ensuring all frontline recruiters were trained in how to spot the signs of modern slavery. Work with clients to ensure we were NMW/NLW compliant.